1) What is your favorite book? cher: Hannah Coulter by Wendell Berry. But I just finished reading the Lord of the Rings trilogy, and I was pretty absorbed… what writing! robin: the one that keeps coming to mind as i ponder this the continuum concept by jean liedloff. i was given that book when i was mid way through my pregnancy with sasha, it blew my mind and deeply impacted my parenting. i have since shared it with every mama/pregnant friend that i can. i have loved books my whole life and have read so many great ones, but you asked to pick one! coree: oh! that’s so hard. lately, to narrow it down to 2 – Simplicity Parenting by Kim John Payne, and Les Miserables by Victor Hugo. 2) Your favorite children’s book? cher: the Wind in the Willows. robin: read aloud family favorite all time hands down is the little house series. for early childhood i love jan brett, you can’t beat those illustrations. coree: Big Red Barn by Margaret Wise Brown, then Caddie Woodlawn by Carolyn Ryrie Brink. 3) Your favorite movie? cher: I’m not that current with my movie watching, but tapping into my former days as a more avid movie-watcher, Like Water for Chocolate was a fav. robin: honestly i can not remember the last movie i saw. crazy! so nothing current is even in my consciousness. can i change my answer to my favorite movie memory? as a youth my family spent winter break in florida, not that unusual for chicagoans. we would, as a family, systematically see every “christmas release feature” as part of our vacation ritual. we would have to drive from our beachside time share to any number of theaters, but in those 2 weeks we would hit them all and spend the drives back talking and laughing and unravelling the film and it’s plot. alternating between singing the movie’s theme songs and holiday jingles, those were some good times. coree: as a teenager, i was obsessed with the movie Amadeus – tortured genius, tragedy, music. love that stuff. 4) Your favorite flower? cher: It depends on what’s blooming! I love flowers! But after driving through the pasture at dusk just now, the smell of honeysuckle almost knocked me over. So that’s my favorite. 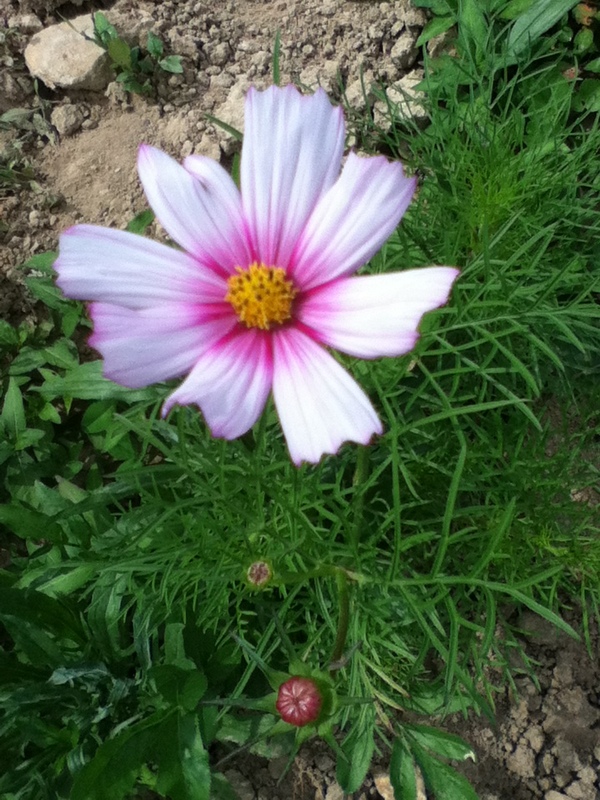 But I noticed the cosmos in the garden just starting to open, so tomorrow that will probably be my favorite. robin: wildflower fave is the trillium, cultivated whatever is blooming, right now the final wave of peonies. coree: the last couple years have led me to a greater appreciation of irises and roses. don’t know why, but it’s the case. 5) Your favorite fruit? cher: as a child, watermelon topped my list. Now? Probably a perfectly ripe peach… so juicy that your entire arm and neck are sticky from the juice. I’m also pretty partial to blueberries, which is a much more reliable crop than peaches here in southern Kentucky. robin: hmmm, this is tough because it is so dependent on ripeness, anything picked perfectly ripe from it’s tree is favored! coree: yes, ripeness has everything to do with it. right now, i loooove sour cherries! in maui we ate such sublime mangoes, and i have to include avocados in my count, too. but here on the mainland – i think peaches are the closest we get to mangoes! 6) Your favorite season? cher: without a doubt, autumn. robin: this is the only one i can definitively answer, been true for me all of my life, autumn, ditto. coree: i love spring before the work load kicks in – those magic warm winds. but i don’t love the mud, so the golden days of fall. 7) Your favorite vegetable? cher: do I have to pick just one? ok, ok… sweet potatoes. But sweet corn is right up there. robin: lettuce, i cry without my salads. coree: whatever is freshest. right now i want a fresh cucumber and sweet salad. i don’t care if i ever see kale again. but in november, i’ll be so glad for kale. that’s an impossible question. 8) Your favorite tree? cher: the sugar maple… the color of the leaves in autumn, the deeply textured bark, the stateliness, and the sap that runs so sweet. robin: the maple for the sweet she offers so willingly each year, it seems we do have a lot in common..laugh coree: have to say, we’re all together on this one – the colors, the textures, the stature. and then there’s canada. maples win. 9) Your favorite beverage? cher: coke (gotcha, didn’t I? I’m only kidding!!!) seriously, our amazing spring water tops my list. and with that water I can make wine and mead, lemonade, tea, and coffee. robin: i think we have to narrow that down to time of day, don’t you? laughing again coree: breastmilk. it fixes everything. lately i’m partial to raspberry leaf tea with lavender flowers. takes the edges off. 10) Your favorite creature? 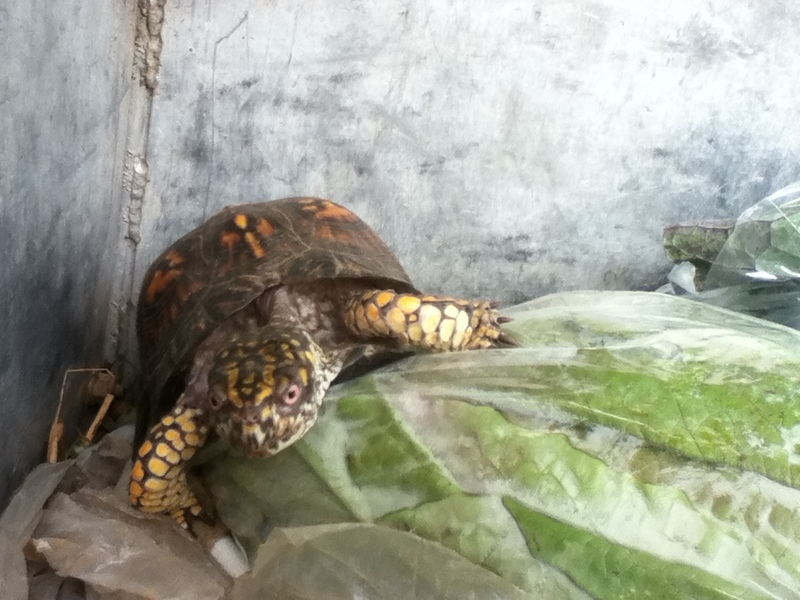 cher: the eastern box turtle… I hope to be one in another life. robin: too difficult, a migratory bird i suppose, sand hill crane? their flights usher the seasons, i love that. coree: too hard! lately, i’m enamored of the great blue heron that daily flies over our hollow. so quiet. 11) Last one, Your favorite music/album? cher: ray lamontagne, till the sun turns black. robin: childhood again, always revert back to clasic rock! coree: yikes. joni mitchell is way up there. lately i’ve enjoyed the heck out of the carolina chocolate drops. i’ll sing anything. coree throws in: thanks cher – that was a blast! This entry was posted in tea time by cher. Bookmark the permalink. Book – Fidelity: Five Short Stories by Wendell Berry; Children’s Book – The House at Pooh Corner by A. A. Milne; Movie – Joe Versus the Volcano (in concert with my family) and Three Seasons (on my own); Flower – Hmmmmmmmmm Rose? (certainly my favorite flower scent), Fruit – Pamplemousse (French for grapefruit, because I love to say that word); Season – Spring (because it signifies new beginnnings and smells of rose and honeysuckle); Vegetable – Greens (particularly mustard, I’ll take it raw or lightly steamed. Please do not overcook! ); Tree – Dogwood (because of the way it’s arms proffer platters of marshmallows); Beverage – Cool, clear water (please don’t add anything to it! ); Creature – The American Kestrel; Music/Album – An Evening with John Denver (since young childhood, he was my first concert, in the round at Market Square Arena in Indianapolis, at about age 12 or so). 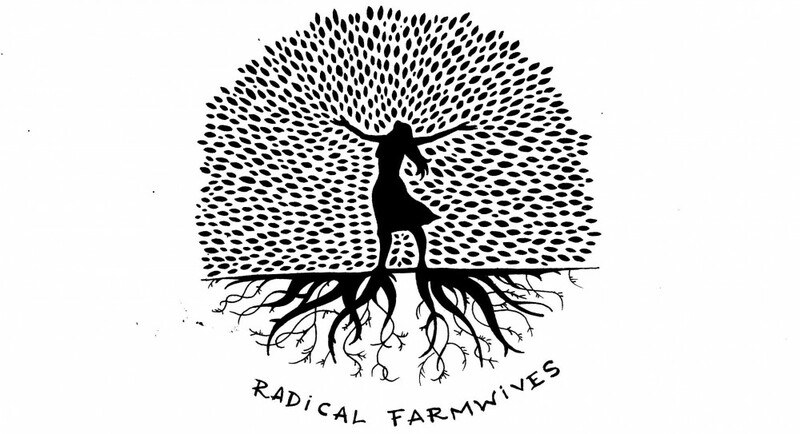 Barb, I LOVE THIS: “Dogwood… the way it’s arms proffer platters of marshmallows.” That is such a fun, creative, perfect fitting, visually delicious description!